Who Moved The Newkirk Viaduct Monument? A 15-foot marble obelisk is meant to be seen, which makes the current location of the Newkirk Viaduct Monument unfortunate. Neither view gives the 1839 monument its due. The obelisk’s four sides carry detailed inscriptions: the names of four railroad companies and dozens of their executives and engineers. Now worn by time and obscured by graffiti, the chiseled letters still bear witness to an achievement of vast importance: the completion of a rail link from the young nation’s largest metropolis to the burgeoning cities to the south. Green: Western foot of the Newkirk Viaduct (1839-1902). Red: Current location of the Monument. In the early 1830s, railroads were a newish invention of such promise that the governments of Delaware, Maryland, and Pennsylvania chartered a quartet of companies to pioneer a route from Philadelphia to Baltimore. Within seven years, their line was complete, except for two river crossings. The builders declared a truce with the Susquehanna River, where a railroad ferry would operate for nearly three decades, but they were determined to bridge the Schuylkill. They chose a well-traveled route. For more than a century, Philadelphia’s gateway to points south had nestled in a bend of the river just below the mouth of West Philadelphia’s Mill Creek. A rope-operated ferry had operated there since 1674; by the 1740s, it was known as “Gray’s Ferry” after its gregarious proprietor, the patriot, politician, innkeeper, and landowner George Gray. 1816: A painting, “Lower Bridge on Schuylkill at Gray’s Ferry” (Joshua Rowley Watson), looks east past Gray’s Tavern to the pontoon bridge first erected in 1777. Sandwiched between the great estates that are today The Woodlands and Bartram’s Garden, Gray’s Inn and its surrounding gardens were a popular day-trip destination for Philadelphians escaping the summer heat. (And not just any Philadelphians; history records trips across the ferry by Benjamin Franklin, Thomas Jefferson, the future Dolley Madison, and, on at least four occasions, George Washington.) Of somewhat broader import, the river crossing linked Philadelphia via the King’s Highway to Wilmington, Del., and Baltimore, Md. In 1777, British troops occupied the city. To assuage the strategic need for a southbound route of retreat, they established the first bridge at the spot by lashing together floating logs and adding a layer of planks. The rickety contraption proved so useful that the Pennsylvania government retained it after the war, replacing it as necessary after floods. It was the Philadelphia, Wilmington & Baltimore Railroad, formed of the four state-chartered firms, that built the first permanent bridge at Gray’s Ferry. Opened in 1838, the 800-foot covered truss carried one track and one road lane, and an unusual telescoping draw span to allow boats to pass. 1838: The Philadelphia, Wilmington & Baltimore Railroad built the Newkirk Viaduct, the first permanent bridge at Gray’s Ferry. An 1856 drawing of the Newkirk Viaduct Monument. To commemorate their achievement, the PW&B’s executives commissioned a monument to stand at the bridge’s western approach. They did not stint in their choice of designer: Thomas Ustick Walter. Already one of the country’s most prominent architects, Walter would go on to build the dome of the U.S. Capitol. History judges him the dean of American architecture between the 1820 death of Benjamin Henry Latrobe and the emergence of Henry Hobson Richardson in the 1870s. Walter drew up plans for an obelisk, about seven feet high, on a square base of roughly equal height. The monument cost $1,100 (nearly $23,000 today), according to Walter’s account book, preserved at the Athenaeum of Philadelphia. Of that sum, all but $70 went to Findley Highlands for “marble work, lettering, hauling, & setting.” It’s unclear why Walter, accustomed to designing mansions and banks, would have taken such a minor job, but it may have simply been a small favor for a big client. Walter had designed Newkirk’s Philadelphia mansion a half-decade earlier; he may have envisioned future contracts for PW&B railroad stations. The monument was set up in 1839 near the western end of the bridge, and that is where our mystery begins: just where was that? Eight years later, city surveyor Samuel Smedley completed his 1863 map, which shows the PW&B mainline coming up from the south-southwest, curving to cross the 25-year-old Viaduct, and heading east toward the Broad Street terminal. The word “Newkirk” appears just outside the curve, at a spot that could fit the guidebook’s description. Might this have marked the Monument? 1863: Smedley’s Philadelphia Atlas. Red circle: “Newkirk.” Only the tan roads existed at that point; the rest were merely planned. Over the next two decades, Philadelphia came into its own as America’s manufacturing powerhouse, and its railroads built furiously to keep pace. Nowhere was the impact greater than the once-rural area around the old Gray’s Inn. In 1863, a new shortline linked the PW&B to the Pennsylvania Railroad and other lines north and west; in 1872, the railroad built a new route to Chester with dreams of fostering a southwest version of the PRR’s upscale Main Line. (A century later, the new route would become part of Amtrak’s Northeast Corridor; the original, part of SEPTA’s Airport Line.) To serve these new junctions, the railroad built railyards, a bigger roundhouse, service facilities, and a new Gray’s Ferry station at 49th Street. By 1886, the area was barely recognizable. 1886: map of West Philadelphia (Baist). Red circle: Newkirk Viaduct Monument. One landmark survived the upheaval. Amid the railyards and the coal chutes, Newkirk’s obelisk still stood sentinel, albeit along tracks now leased to the Reading Railroad. With the unmistakable label “MONUMENT,” Baist’s 1886 map confirms our speculation about Smedley’s map, and places the stone just northeast of the notional intersection of 48th Street and Grays Ferry Avenue. With the mystery of the Monument’s original location laid to rest, can we figure out when and why it was moved? 1894: Sketch by Philadelphia Dept. of Public Works shows proposed bridge at Gray’s Ferry. Red circle: the Newkirk Viaduct Monument. It was still there in 1927, when it was caught by the Dallin Aerial Survey company making some of the first high-quality aerial photos. The Monument sits on its embankment above the Reading line, although it’s not clear whether any remnant of its fence still surrounds it. The photo also contains a clue about why the Monument was moved. If we look some 200 yards farther west, we can see a two-story, twin-gabled building in the shadow of the 49th Street Bridge. This is Grays Ferry station, built for the new Chester route in 1872. (By the time of this photo, the PW&B had become the Philadelphia, Baltimore and Washington Railroad, a key subsidiary of the sprawling Pennsy system.) That station sits right where the Monument does today. Today, no trace of the station remains, nor of the Newkirk Viaduct itself. In 1901, the city opened Gray’s Ferry Bridge, whose four-lane roadway and streetcar tracks provided a capacious new thoroughfare across the Schuylkill. The following year, the PW&B built the single-track Philadelphia, Wilmington and Baltimore Railroad Bridge No. 1 and tore down the Viaduct. Both new bridges served until 1976, when the road bridge was replaced by today’s Grays Ferry Avenue Bridge and the railroad swing bridge, by then owned by Conrail, was locked open and abandoned to the elements. And the Monument? It’s not clear when it arrived at its current location, though it would likely have been no earlier than the late 1930s, when Grays Ferry Station ceases to appear on PRR timetables and this map of the PRR’s Philadelphia Terminal Division. And why? Here is where the available evidence leaves off, although the answer may be waiting among the thousands of linear feet of PRR documents held at Temple University, the Hagley Library, and elsewhere. It seems reasonable to think, however, that a history-minded PRR official decided that the Monument should be rescued from the railyards that had grown up around it. The vacant lot left by the Grays Ferry Station, along the main line, may have seemed a suitable new home. This much is certain: the Monument stands for more than the completion of an early American truss bridge. It stands for railroads, which became the sinews of a young nation. It heralded the fruition of the Industrial Revolution, as represented by the myriad factories of Philadelphia. It even bore witness to the earliest glimmering of our own era’s information revolution. In 1846, copper telegraph wires were installed over the Newkirk Viaduct, completing the first telecommunications link between New York and Washington, D.C. (The wires were disconnected every time the draw opened, so that every schooner and scallop boat that plied the Schuylkill interrupted telegraph service between the nation’s capital and its financial centers.) In short, few monuments have so much bound up in them. A proposal: move the Monument back to its original location—or closer to it, anyway—as part of the proposed Bartram’s Mile public greenspace project, whose planning is currently underway. This would put the Monument along the Schuylkill Banks trail that is to be extended from the new Grays Ferry Crescent segment, and it would create a perfect centerpiece for the proposal’s industrial archaeology segment. Why just post signs about history when you can have history itself? At last, one of Philly’s oldest and most distinguished memorials might be restored to dignity, ready to spur us once again to memory and reflection. 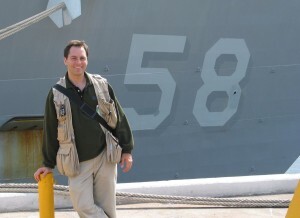 Bradley Peniston is deputy editor of Defense One, a publication of Atlantic Media. He has written two books about the U.S. Navy. He also launched Pecha Kucha Night Philadelphia. Find him at navybook.com. Great story! Who “owns” the monument now, and whose permission would be required to move it? Any ideas on how much it would cost to relocate it? Seems like it shouldn’t be an outrageous amount of money; would be perfect for a kickstarter project or something similar! Is there anyone out there advocating for this already? As for advocating, PennPraxis is gathering community input on the Bartram’s Mile project. They are aware of this proposal; I would send your ideas and your energy to PennPraxis’ Andrew Goodman (praxis@design.upenn.edu). And by the way, if anyone wants to dig a bit more deeply into the sources used for this story, I’ve posted a version with links. hello. about 20 years ago the members of the national railroad historical society, phila chapter was interested in relocating the monument to 30th st. station. At that time the station was not interested. When I heard about the “porch” idea for Market St. I THOUGHT THAT WOULD BE THE PERFECT place. I had met with a few people that were working on the project. I sent them images and the info I had. I did not hear anything from them. I am still interested in relocating the monument along with many members from the local railroad organizations. Great article! Very interesting story to this piece of work. I hope that it finds a better home. Though I am not aware of who relocated the monument previously, George Young Company will dismantle, transport and re-erect the monument in late summer/fall of 2016 to The Bartram’s Mile project. George Young Company, established in Philadelphia in 1869, has moved the majority of sculpture and monuments that have been relocated including The Liberty Bell, Abraham Lincoln Memorial, a replacement test panel for The Tomb of the Unknowns, Rocky, Love, The Clothespin plus hundreds more just in Philadelphia. Terrific! When will this happen? Heading to DC Saturday I looked in vain for it – I guess now I know why! Bravo for your research work and preservation efforts. Please contact me. I would like to assist.